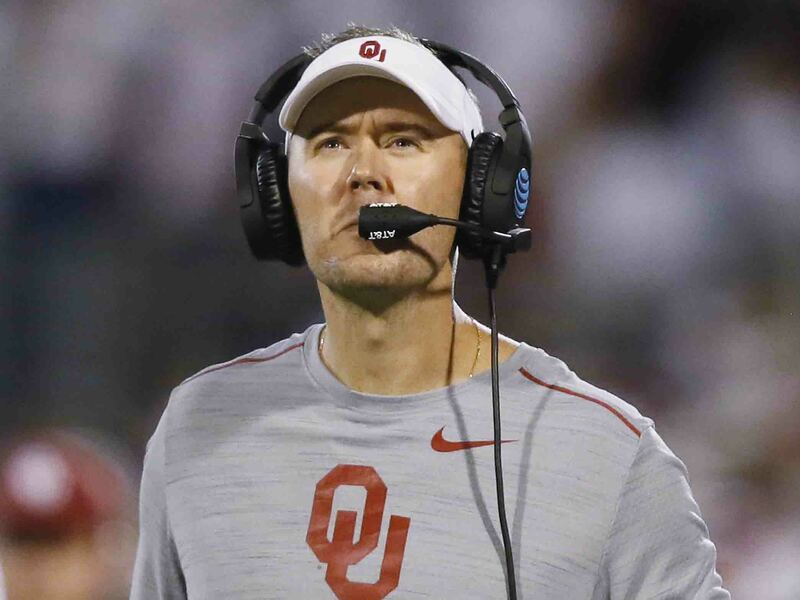 Those who know new Oklahoma coach Lincoln Riley best are not surprised that he's in charge of a major college program despite being only 33 years old. Last fall, the football team in Muleshoe, Texas, a tiny town about 20 miles from the New Mexico border, added a twist to its spread offense. Under coach David Wood, who’s led the Mules since 1996, the team began to throw long balls not to the outside receiver, but to the inside man, even against Cover-2 defenses. The play call was in opposition to conventional wisdom, but it worked, over and over. Throw to the inside receiver, but over his outside shoulder, hope the defender outruns the play, and voila. The call led to several touchdowns for Wood’s 8-5 squad. Over the years, Wood has adapted his offense, embracing a high school version of Mike Leach’s scheme at Texas Tech. He’s a student of the game, but he can’t take credit for that twist, which came from the source whose brain he’s been picking for years: his former quarterback Lincoln Riley. Named the head man at Oklahoma on June 7, Riley, though he’s traveled the country moving up the coaching ranks, has never strayed too far away from Muleshoe. He’s back often, and Wood takes full advantage of one of college football’s brightest young minds. "Every chance I get, I talk to him, because I just know he's on the right track,” Wood says. “I know that if he's saying it, we've got to somehow get to the point where we can do the same thing." When Riley took over for Bob Stoops last week, he did so at just 33 years old, making him the youngest head coach in the FBS ranks. It’s familiar territory; when Leach made Riley Texas Tech’s receivers coach in 2007, he was just 23 and the game's youngest full-time coach. Predictably, much of the discussion of Riley since he’s assumed the Oklahoma job has focused on age and tenure; not only is he a football wunderkind, but he’s also replacing the game’s longest-tenured coach in Stoops, who led Oklahoma for the past 18 seasons. His hasty promotion is in large part because Riley’s work for the Sooners speaks for itself; he’s led one of the best offenses in the country as their coordinator the past two seasons. But that’s only the start of it. Under Riley, Oklahoma’s offense has been staggering en route to two 11-2 seasons. Last season, it was No. 10 among FBS schools in passing yards (4,134), No. 16 in rushing yards (3,078) and No. 3 in total yards from scrimmage (7,212). The year before, it also finished in the top 25 in the country in all three categories—and No. 10 overall in total yardage. Those numbers are in stark contrast to 2014, when the team went 8-5, and its 6,041 yards from scrimmage landed its offense at No. 26 in the country. Riley is the main man responsible for that resurgence, and Ryan Hybl, Oklahoma’s men’s golf coach and a close friend, says that from just a few months into the young coach’s tenure, many around the athletic department predicted he’d be a head coach in no time. They just figured it’d probably be elsewhere. That’s a fast consensus at one of the most competitive football schools in the country, and it was due to more than just Riley’s on-field production. In fact, the buzz began before he’d done anything in a game at all. In almost no time, Riley was known on campus for his approachability, his relaxed nature and, most importantly, his brain. "This is not a nobody in the college football world,” Hybl says. “He's been a quick riser, maybe one of the quickest risers you've ever seen." In 2002, Texas Tech’s roster included a freshman quarterback from Muleshoe with a delivery Leach described as sidearm. The teenager planned to coach in high school once he earned his degree, and he figured he’d try to walk on to the Red Raiders in the meantime. The odds were stacked against him. Leach remembers nine quarterbacks going out for three spots that fall, with two already set in stone: starter Kliff Kingsbury and backup B.J. Symons. Riley didn’t have the arm to earn the place up for grabs, but his intellect struck Leach in camp. “He couldn't get the ball there, but it wasn't for a lack of knowing where to go with the ball,” says Dennis Simmons, Oklahoma’s outside receivers coach, who was an assistant athletics director at Texas Tech in 2002. “I cut him,” Leach recalls, “and hired him the next day." From 2003-2006, Riley served essentially as Leach’s right-hand man, for three years as a student assistant and another as a graduate assistant. On a staff that included Dana Holgorsen as its inside receivers coach, Art Briles coaching running backs, Ruffin McNeill in charge of linebackers and Sonny Dykes as receivers coach, Leach chose Riley to bombard with questions. That was the gist of the job description: listen, synthesize, speak your mind. "There (was) a lot of scheming, pondering, analyzing players,” Leach says. “How are we going to get this guy better? What does he need? Do we need to push him? Do we need to coddle him a little bit? Do we need to pick this guy up? How come we can't get through this guy? Why does he have this whole entitled attitude? But then there's also Xs-and-Os-type stuff. You're watching film. What are they trying to do here? Do you think they'll try to do this against us? Well, we pass it more than this team does, so they may not do it as often. How would this matchup be? What about this one instead of that one? It's just relentless, all day long. "I would give him little projects, stuff I wanted him to study, just some concept or some scheme thing. I'd put him on it and have him study it, and he'd write up a report, give me a report,” the coach continues. “I was trying to constantly add to our knowledge base, self-scouting what's effective for us, what's not. He was my right-hand task guy." When it came time to fill Dykes’s job in 2007, Leach says he took applications from coaches with decades of experience. Instead, he chose Riley. In 2009, when Leach was suspended indefinitely in late December, Riley was promoted to offensive coordinator for the Alamo Bowl, which Texas Tech won, 41-31. Soon thereafter, McNeill took the East Carolina job, bringing Riley and Simmons along. At 26, the walk-on from Muleshoe was a coordinator, and in the years that followed, those close to him say, he fielded interest from many a major program before making the jump to Oklahoma in 2015. Riley was so smart, Wood says, he could have done anything. Being a head football coach at 33 is some kind of accomplishment, but Wood at the time thought Riley might use all that math he memorized to be a rocket scientist or astronaut. Hybl barely knew Riley when the two traveled together to Palm Springs for a golf fundraiser in February 2015. The coordinator had been on the job at Oklahoma only weeks, but on the flight home, Hybl was shocked by the insight the new hire shared with Cale Gundy, who at the time coached the Sooners’ inside receivers. “They were already speaking plays and breaking down things and whatnot,” Hybl says. “I'm sitting across the way from them, and I'm... listening, and right then, I could tell that this guy was very analytical. He could dissect very quickly, from a play perspective. He's really smart, and I think for him, it's kind of like a game (within a game), how quickly can he get down the field. There's not a formula, because you still have to feel out the game, but he is very, very, very prepared and understands what other people are going to do maybe before they even do it." According to Simmons, working with Riley is a study in focus. He’s constantly impressed by the younger coach’s memory, even after more than a decade working with—and now for—him. More impressive, though, is that he’s constantly challenging himself, continuing to build that knowledge base Leach set the foundations for at Texas Tech. Earlier this year, Riley spent time with the Patriots studying their offense and operations. At the first offensive meeting of the spring in Norman, Simmons says, he unloaded his notes. This is what they did, this is how it applies to us, we might want to start looking at this. In some coaches, that level of detail and research can manifest as an intense outer shell. But not in Riley, whose success Simmons credits to two factors. But in all the discussion of Riley since he was hired—the celebration of his smarts and what he’s done the past two seasons at Oklahoma, the talk of his recruiting chops and that he’ll hold onto the play-calling—one trait, Simmons says, has been overlooked. It’s a trait that will serve him better as a head coach than it has in any position so far, and in many ways, Simmons says, it’s Lincoln Riley in a nutshell. Rewind two years. Riley had just taken the job at Oklahoma, and he had a few spots to fill. One, he earmarked for Simmons, who was by then working for Leach at Washington State. Riley recalled that Simmons’s wife had grown up in Ft. Worth, and then he called Simmons and gave his pitch. Simmons felt loyal to Leach but curious. It was flattering Riley wanted him so badly. He went home to tell his wife the news of his friend’s new job and to share the offer he was considering. But his wife spoke first. “Hey, have you talked to Lincoln yet?” she asked. Simmons should have known: Riley had called his wife before he’d even extended him the offer.